Heading over to the UK in a few weeks and I know there are some great rums there that we don't see here, so any suggestions about what I should look out for. I tend to like rums that don't have a ton of added sugar, been enjoying lately Foursquare 2004 and Criterion and Appleton 21 and Joy. Passing through Heathrow Duty Free, but don't know if they have much last time through there it was a little disappointing on all fronts unless you spent a lot of money one a special bottle. I flew through Heathrow a few months ago and my recollection aligns with yours - fairly disappointing selection of reasonably priced bottles. They should have Havana Club Anejo, 7yo, and Seleccion de Maestros if you need to scratch a Cuban rum itch. The only thing bottle I was really tempted by was this Single Cane Estate Rums from Worthy Park, but I didn't know anything about it and being bottled at 80 proof it seemed likely to have additives. I was hoping they'd have the new Worthy Park OBs (http://thefatrumpirate.com/worthy-park-single-estate-reserve) in the airport but alas they did not. You should be able to find them elsewhere in the UK if you look though. Are you spending time in London? There are a few shops there with good rum selections. Whisky Exchange is a good stop. If you go to the store in Covent Garden they have a “bottle your own” kind of thing on the top level towards the back of the store. It’s easy to miss so you gotta look for it. They made it sound like they usually keep one of the casks full of rum. I was pretty disappointed with the selection at Berry Bros & Rudd. It’s possible that they were wiped out from the holidays (I went just after Christmas) but it seems unlikely since there weren’t empty slots on the shelves or anything where maybe they ran out of certain things. They only had a couple BBR bottled rums and not very many malts either. Cool location and nice looking shop though. I’d recommend skipping BB&R in favor of either Cadenhead’s or Hedonism. You can check Cadenhead’s selection online (https://www.whiskytastingroom.com/cadenheads-rum) to see if there’s anything that interests you. Hedonism will have all kinds of odds and ends - there were many bottles that intrigued me but most were out of my price range at the time, having spent much of my budget at Cadenhead’s. 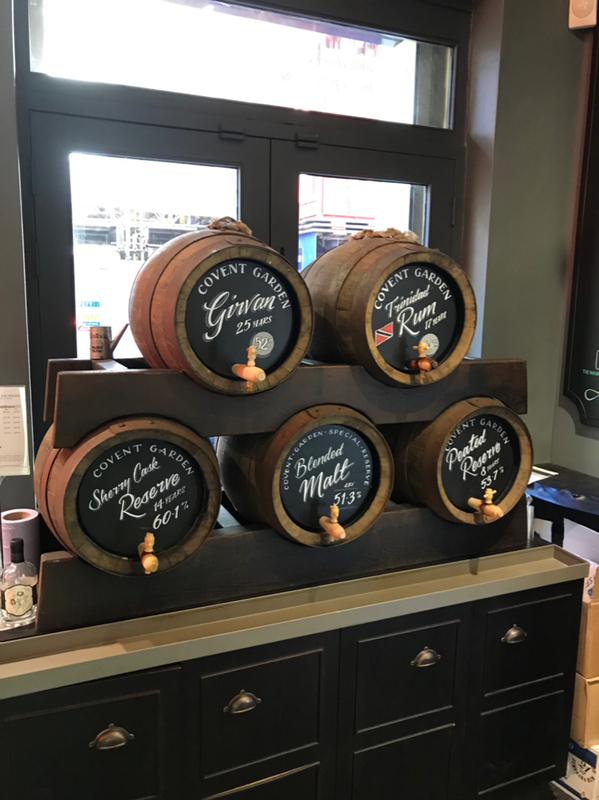 Here’s a pic of the live casks at The Whisky Exchange.